DAMMIT, WE THOUGHT 2017 WAS OVER: Fifteen people are confirmed dead and over 100 are missing after devastating mudslides in the Montecito area of Santa Barbara County hit by the Thomas Fire in December. Hundreds are stuck in houses who rescue officials hope to airlift out today and an unknown number of homes were forced off their foundations by mud and rushing water. Highway 101 remains closed and covered in mud with stuck cars. It's going to take awhile to clean up, blocking the communiting route to and from LA/Ventura to Santa Barbara. BUDGET: I will have a budget supplemental Nooner for paid subscribers this afternoon. The morning is just too crazy on the political front to turn around something decent on the budget in an hour after its release. If you don't want to commit for a year, you can do a one-month subscription for $5, although a year supporting independent journalism is always appreciated. Here is the budget summary (aka "The A Pages"). Good morning! As if this morning wasn't busy enough, Congressman Darrell Issa has announced his retirement in CA49 (Carlsbad), where he was one of the most vulnerable House Republicans in the country. Hillary Clinton won the district, which stretches along the coast from southern Orange County to north San Diego County, by 7.5% in 2016. I already had it as Leans Democratic and The Cook Political Report followed suit this morning. The district moves from some of the wealthiest, whitest neighborhoods in California in the north to working class and military neighborhoods in the south. Camp Pendleton is in the district. Issa had been routinely assuring his staffers that he was in for the fight, leaving many shocked by this morning's news. Bill Brough - Member, State Assembly (if Harkey does not run, as he's her former chief of staff). He is a former Dana Point city councilmember, a former congressional aide to Chris Cox, and George W. Bush administration official. Rocky Chávez - Member, State Assembly. Chavez is a veteran (Marine Corps) known as an advocate for veterans' issues as well as for immigration reform, including the DREAM Act. He resides in Oceanside in the northern San Diego part of the district, where he served on the city council. Diane Harkey - Member, State Board of Equalization (which has lost most of its power) and former Assemblymember. Her BOE district covers the entire CA49. Since she is up this year, that would lead to an open BOE seat, coveted for a great salary and few responsibilities until there is a constitutional amendment. Like Brough, Harkey is from Dana Point in the Orange County part of the district. The big question--is Rep. Dana Rohrabacher (CA48) next? 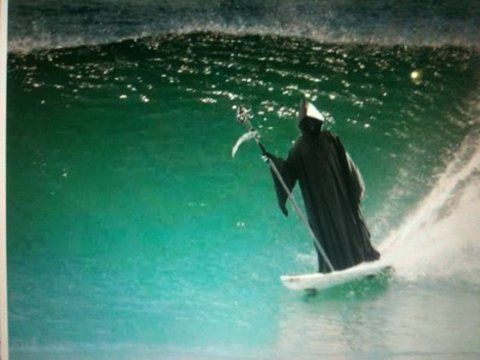 The pot-smoking, surfing Grim Reaper is hanging out in the southern Surf City today. As they say, they always come in threes. The scramble around CA39 (Fullerton) continues following the announced retirement of Rep. Ed Royce. As noted up top, we had five "I'm in" messages yesterday, including three particularly big names. Former Assemblywomen Young Kim hopes to take the political reins from her former boss and entered the race yesterday with Royce's support and with a campaign run by his consultants Gilliard Blanning. Kim would be the first Korean-American woman in Congress. Kim is from Fullerton in AD65. Also jumping in is former Senate Republican Leader Bob Huff, who represented much of the congressional district when he was served in SD29. After all, Senate districts in California have, on average, a population 25% larger than congressional districts. Huff is from Diamond Bar in the northern, Los Angeles part of of the district. Supervisor Shawn Nelson represents Brea, Buena Park, Fullerton, La Habra, and Placentia. He is term-limited and joins the race. Kim had been running to succeed him on the board. Visualize the overlapping districts here. Click on the districts on the left to focus only on CA39 and AD65 or SD29. With the news of these three prominent entries, it's unclear whether the other two Republicans that jumped in earlier yesterday--accountant John Collumn and La Mirada councilmember Andrew Sarega--will follow through. As I wrote yesterday, Democrats would hope everyone stays in. They are now eyeing having a majority of the Orange County congressional districts, even if Rohrabacher stays in. As a kid growing up there, this is an unbelievable shake-up. However, that even if Democrats dreams are realized, waves always recede. Now, who runs for Nelson's supervisorial district now that Young Kim is running for Congress instead? La Mirada councilmember Tim Shaw is in the race for the GOP, although many are looking for others after Kim's exit. The district is 40.3% Democrat, 32.4% Republican, and 23.4% NPP. So, while Nelson overwhelmingly won re-election in 2014, Democrats could make a play with the right candidate in what could be a wave year. It's a majority-minority district, although the June 5 election will be whiter and more conservative. Some have suggest pediatrician Mai-Khanh Tran, who has already lent her congressional campaign $250,000. However, she lives in supe district 3. Gil Cisneros, another well resourced Democrat in the congressional race, also lives in Yorba Linda--district 3. CH-CH-CH-CHANGES: Yesterday, the Senate Democratic Caucus voted officially to make Toni Atkins the next Senate President Pro Tem, which will take effect March 21. She will become the first woman to assume the role. Needless to say, she will also be the first openly lesbian woman. The Trump administration Tuesday night suffered a legal blow in its attempt to end a popular program that shielded from deportation people brought to the United States illegally as children by their parents. But the victory may be short-lived. U.S. District judge William Alsup of the Northern District of California issued a preliminary injunction in a lawsuit by the State of California and others against the Trump administration and the Department of Homeland Security over its decision in September to end Deferred Action for Childhood Arrivals (DACA), an Obama-era program that granted temporary legal status to about 800,000 people who entered the United States undocumented as minors. There are currently about 689,800 people enrolled in DACA, according to court documents. TWEETER IN CHIEF: POTUS labels California's senior senator as "Sneaky Dianne Feinstein" for her release of the Fusion GPS testimony. Is that an endorsement of Kevin de León or an assist to Feinstein? DEPT OF CORRECTIONS: Retiring Republican Rep. Bob Goodlatte is from Virginia, not Massachussetts. The Office of LA City Councilmember Mike Bonin is seeking a detail-oriented, organized, and tech-savvy person to serve as Scheduler. We need a supercharged scheduler who loves the job and understands that the Councilmember’s time is the most important tool we have for serving constituents well. This is not a 9-5 job; it will require you to be aware, accessible, and on top of the schedule on nights and weekends. Compensation based on experience. Application Deadline - 1/17/18. Send cover letter and resume to david.grahamcaso@lacity.org. Full job post at bit.ly/JobPosting_CD11Scheduler. Sen. Kamala Harris was named to the Senate Judiciary Committee on Tuesday, joining California’s other Democratic senator, Dianne Feinstein, on the panel that reviews President Trump’s judicial nominees. Saying itâs time for his party to regain its relevance in California, the former Assembly Republican leader said Tuesday heâs launched a new political organization to focus on issues on which the GOP can find common ground with voters who now routinely elect Democrats. So far, the civil service changes have focused on making it easier for job candidates to apply for a state job and on eliminating the hundreds of unused job titles that clutter up human resources manuals. Those changes were aimed at helping the state recruit younger workers to positions being vacated by retiring baby boomers. The IT reclassification is trickier because it affects people who actually work for the state and will rely on the new guidelines to plot their careers going forward. California State University turned away more qualified applicants than ever last year — 1 in 10 students, or 31,000 people — even though the state’s Master Plan for Higher Education says they should be admitted. When it comes to the long-term health of the country, findings now show the big problem might not be health care at allÃ¢ÂÂit might be everything else. Can researchers get politicians to pay attention? A federal judge on Tuesday night temporarily blocked the Trump administration's decision to end a program protecting young immigrants from deportation. Sen. Dianne Feinstein (D-Calif.) and House Majority Leader Kevin McCarthy (R-Calif.) voiced disagreements about immigration issues during a White House meeting hosted by President Trump on Jan. 9. Former Vice President Joe Biden largely avoided mention of todayâÂÂs political fray during the latest stop on his book tour Tuesday in San Francisco. But the 75-year-old Democratic statesman, while leaving open the question of whether he was just another retired politician with a memoir to sell or a 2020 contender for president, made clear he was still in the game. His folksy exchanges with the Bay Area audience about family, sports and religion and his subtle jabs at the dysfunction in Washington had all the hallmarks of the campaign trial. âÂÂYou canâÂÂt run this country without consensus,âÂÂ he said, lamenting that thereâÂÂs no longer a place in the U.S. The candidates who could step up to run in the 39th Congressional District.